The Big Combo traps it viewers from the jump off. After the opening credit sequence, accompanied by David Raksin’s burlesque score, we see Susan (Jean Wallace) attempting to flee Brown’s clutches. She’s bolting through darkened alleys, around blind corners, and right back into the arms of Brown’s henchman, Fante and Mingo. These goons are played by Lee Van Cleef (Fante) and Earl Holliman (Mingo). The censors must’ve been half asleep when they watched The Big Combo, because by the end of the film, there’s no doubt Fante and Mingo are gay lovers. The message of that opening chase is clear: Susan is Brown’s sexual possession, she doesn’t have the freedom to leave him. Once that’s established, Brown makes his entrance. It’s in a smoky locker room immediately after a boxing match. Brown, played by the noir chameleon Richard Conte (honestly, this guy could do anything), explains to the losing fighter why he’ll never make it as a prize fighter. Hate, he explains, is the key to success. “Hate the man who tries to kill you. Hate him until you see red and you come out winning the big money. The girls will come tumbling after.” Again, Brown’s possession of Susan is where he draws his power from. 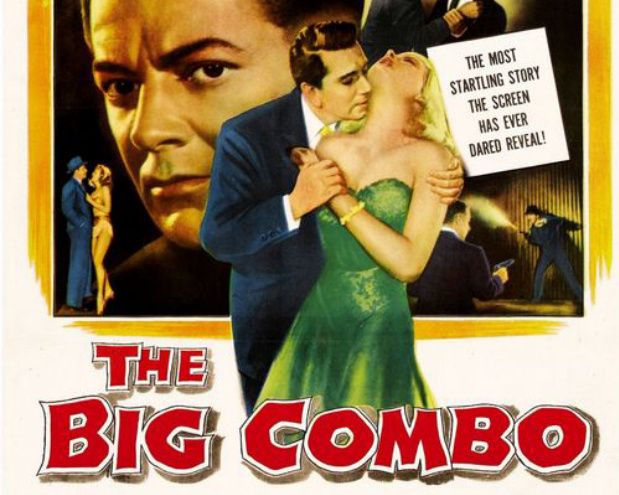 The next player introduced in The Big Combo‘s sexual game of chess is Lt. Leonard Diamond (Cornel Wilde), a tenacious ball of frustration obsessed equally with taking down Brown and taking Susan to bed. He employs a lot of methods to get Brown locked up, but he’s thwarted at every turn. Brown is simply too smart for him and has too much sway behind him. It’s actually fun to watch Brown walk all over him – check out the lie detector test for a solid example of how Brown, even when he’s caught in a lie, can run circles around Diamond. Deep down, however, Diamond has no interest in seeing Brown behind bars. No, he wants to neuter the sonuvabitch. One of The Big Combo‘s most infamous scenes is incredibly sadistic for its time. Brown and his henchman capture Diamond and decide to have some fun at his expense. They’re smart enough to not leave any marks though, so they tie him to a chair, shove a hearing aid in his ear, and blast jazz point blank from a speaker (there’s a nicely timed drum solo). Then they pour booze down his gullet and dump him on the chief’s doorstep. It’s a brutal scene that packs a powerful visceral impact. The look on Mingo’s face is chilling as hell. Going back to what I mentioned earlier about Mingo and Fante being homosexual, there are a few suggestions peppered throughout the film. At one point Brown calls them late at night, Fante answers the phone on his bedside. On a bed extremely close to his own is Mingo. The way it’s shot by John Alton, it looks like they could be close enough to be sleeping in the same bed. It’s adorable. Later, when Diamond’s efforts against Brown finally begins to bear fruit, Mingo and Fante are holed up in a hotel basement. They’re ordered to hang tight until Brown can securely get them outta town. Mingo is getting restless. When Fante suggests he have a sandwich, Mingo mumbles that he “can’t swallow anymore salami.” Maybe I’m reading too much into this, but c’mon. John Alton’s bravura lighting is pure noir. The low budget and minimum sets demanded imagination behind the camera, bringing forth a condensed battle between light and shadow. Some of the sets are consumed by dark, hiding the small sets and trapping the players in a doomed world. The climactic scene in the airplane hangar is a prime example – it’s visual noir 101. Heavy fog rolls outside, a spotlight makes its rounds, and the shadows could cut through wood. The only light offered in this final scene comes from Susan – both literally and metaphorically. She exposes Brown for the coward, emasculated hood he really is. It’s a fitting ending for a perverse film. Although it’s left ambiguous, I really hope Diamond didn’t get Susan after the credits rolled. I have a strong feeling he would have attempted to possess her much like Brown did. It’s a cruel circle of sexual dominance indeed.